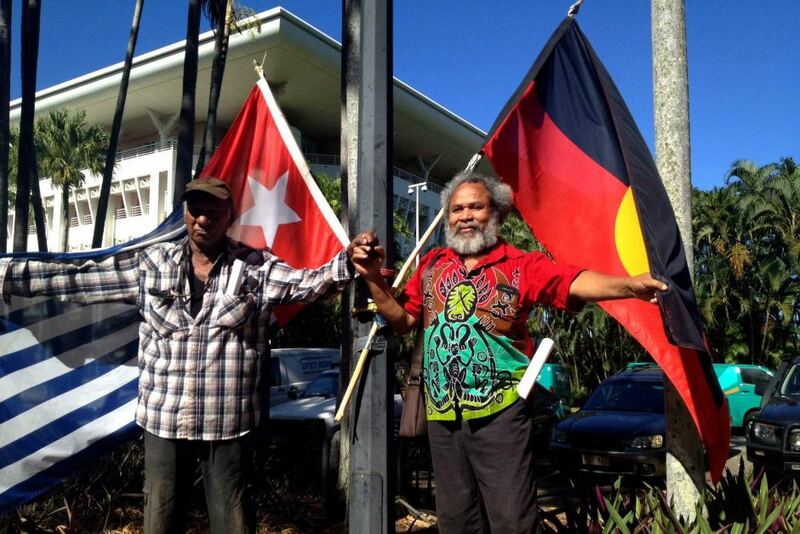 The world’s only West Papuan embassy was established yesterday on the lawns of the northern territory parliament, this morning it still stands, but it is under threat of eviction. The embassy is making history, with West Papuan, Larrakia and Arabunna Elders and non-indigneous activists gathering on the grounds outside parliament drawing attention to the ongoing genocide in West Papua by the Indonesian occupiers. With a traditional Honai hut erected, a welcome by Larrakia elder June Mills, and the morning star flag flying, the embassy stands as a space where West Papuan culture is celebrated. Exile West Papuan Foreign Affairs Minister, Jacob Rumbiak, said recently the occupation in West Papua has worsened with Indonesia killing hundreds involved in the student movement. The embassy has resulted from a 3 day forum on the West Papuan struggle in Darwin, which was attended by West Papuan, Larrakia, and Arabunna elders, and representatives as well as non-indigenous supporters, including crew members from the West Papuan Freedom Flotilla. The Freedom Flotilla is set to sail again to draw attention to the destruction and genocide perpetrated by multinational corporations and colonial governments against the West Papuan people, we are targeting share-holder Rio Tinto over the Freeport Grasberg mine.